Crown Hill Cemetery is the third largest cemetery in the United States at 555 acres. It was established June 1, 1864, and now is the burial ground of three Vice Presidents–Charles W. Fairbanks, Thomas A. Hendricks, and Thomas R. Marshall–an infamous bank robber, John Dilliger, Indiana’s own Hoosier poet, James Whitcomb Riley, and the 23rd President of the United States, Benjamin Harrison. In the latest survey of historians Harrison falls in the fourth quartile ranking at 33 of the 44 men who have had the title of president. 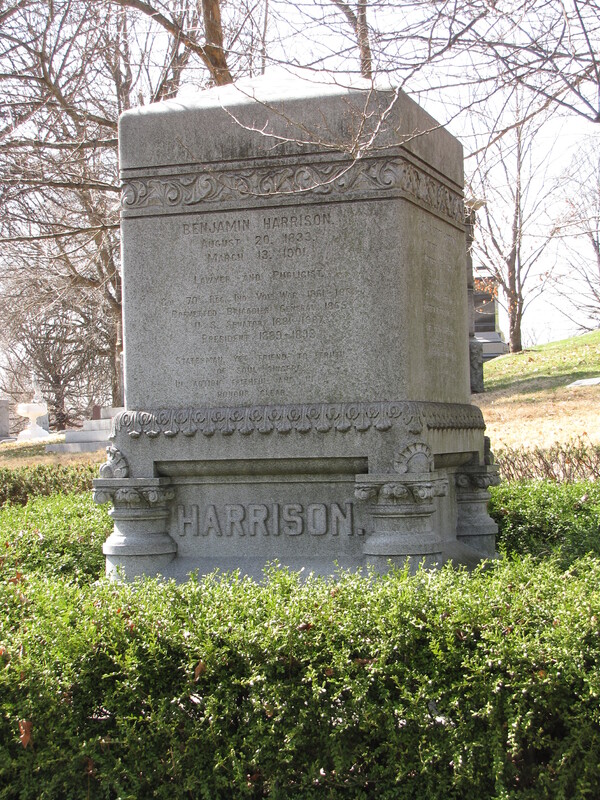 Though Americans don’t remember his service in the Executive Office, Harrison served admirably as a soldier in the Civil War, as a United States Senator, and as President. 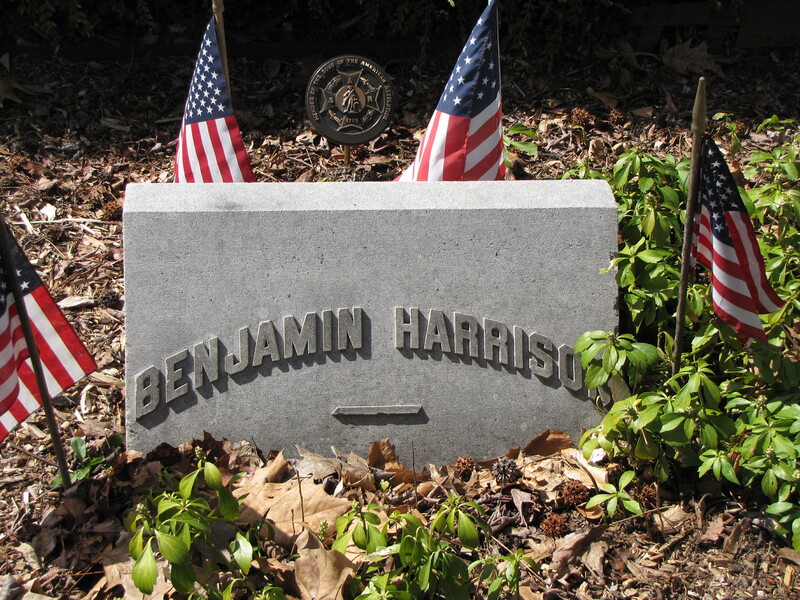 Benjamin Harrison was also a highly successful lawyer, perhaps the most successful attorney to serve in our highest office. One legacy from his 1888 campaign against Grover Cleveland was a phrase that has made it into the common use. During the political fray, pols rolled a 14 foot ball sporting numerous campaign slogans through the streets. From this the expression, “Keep the ball rolling!” became popular. His monument is a large gray granite block and an example of Victorian ornamentation. 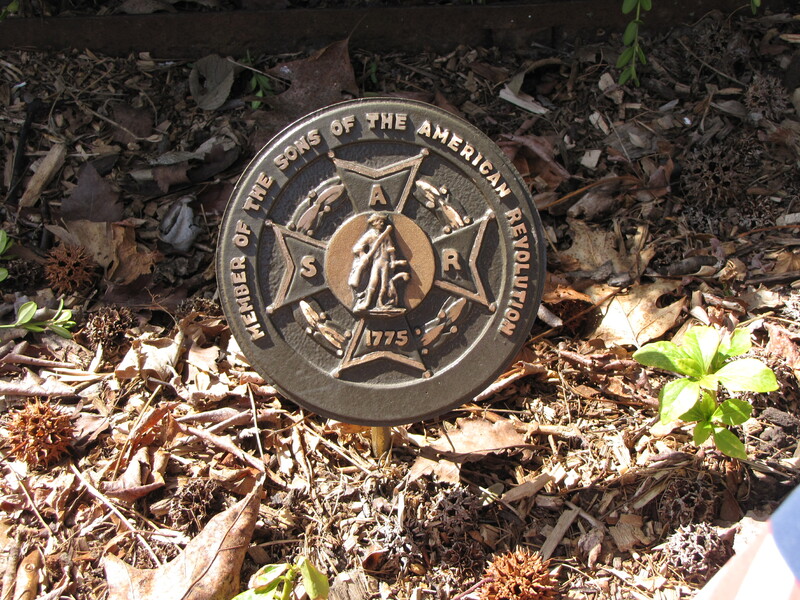 The metal marker showing Harrison’s membership in the Sons of the American Revolution honoring his ancestor of the same name, Benjamin Harrison, a signer of the Declaration of Independence. This entry was posted in Presidential graves. Bookmark the permalink. Thank you for writing this piece on President Harrison. My husband’s family on his father’s side is a direct decendant of the President and I am going to show this article to him today. My husband’s brother was named after him and also his son. Angie, you should check out the latest post on William Henry Harrison. It includes information about John Scott Harrison and William Henry Harrison, both ancestor’s of your husband.